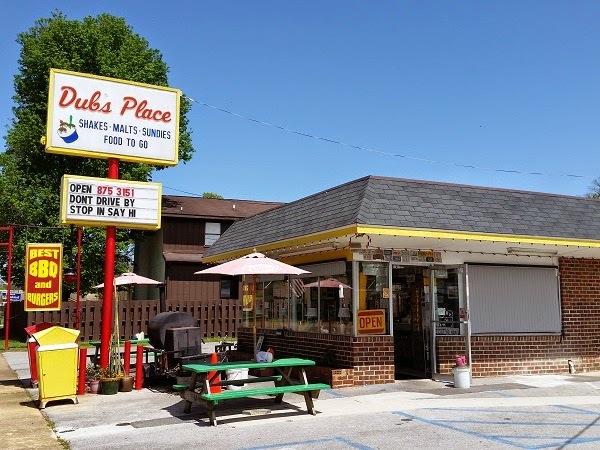 Dub’s Place, Chattanooga TN – Marie, Let's Eat! Every once in a while, you stumble onto the neatest surprise, and, still full from our lunch at Couch’s in Ooltewah, we made our way to the Red Bank neighborhood expecting to find a simple, no-frills fast food dairy bar for a snack and instead found that this place takes its fast food very seriously. Dub’s Place originally opened in 1952 and spent the decades in a slow decline, as these sorts of businesses often did. For many years, they had this strip mostly to themselves and served up ice cream treats and occasionally burgers and hot dogs, but the intrusion of national fast food chains into the neighborhood meant that later arrivals didn’t blink twice at the old-fashioned place. When Jordan Miller bought it in late 2011, some old-timers hoped he could give it a new lease on life. Boy, did he ever. I think that you set an expectation for what one of these places will provide, and when you learn instead that they make darn near everything but the ice cream by hand, it’s certain to impress. To illustrate, consider the fries. I figured the three of us would share an order of fries with our sundae and our milkshake. We were expecting something from the delivery truck. We were certainly not expecting something as wonderful as these bad boys. Wow! 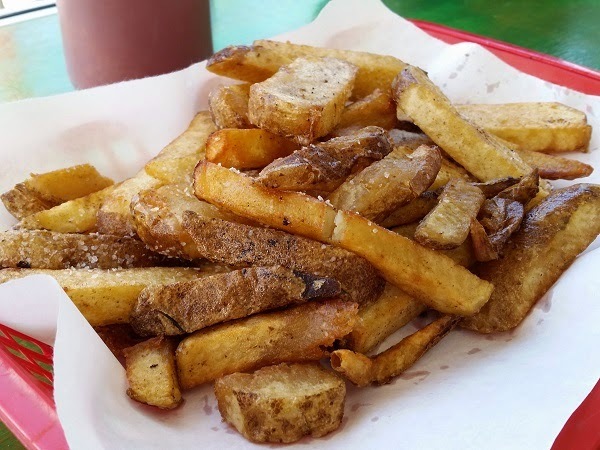 We got some absolutely delicious hand-cut steak fries, given a liberal sprinkling of kosher salt. These were some of the best fries we’ve ever had, honestly, which shouldn’t have been a surprise considering the rest of the menu. 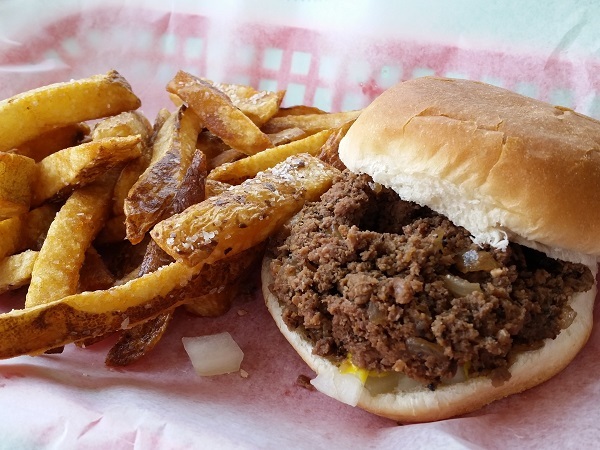 They smoke barbecue here, make their own hamburger patties, and even make their own version of those midwestern Maid-Rite loose meat sandwiches. I’m exceptionally glad that we stopped by for dessert here, because we are definitely coming back on empty stomachs one day to dig into this menu. Oh, and the ice cream was better than just fine. 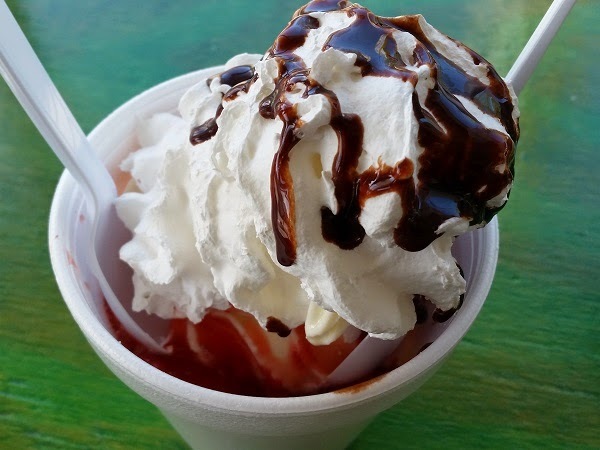 Marie and our son shared a vanilla sundae with strawberries and chocolate sauce, and I had a grape milkshake, made with vanilla ice cream, Fanta, and some grape syrup, and it was all kinds of good. We’ll be back in Chattanooga in about three weeks, and we’re planning to give this place a longer look. This isn’t a much longer look, but we did stop again in mid-June for another snack, and this time I tried one of the celebrated “crumble burgers,” as Jordan calls them. I thought it was quite delicious, and every bit as good as how I remembered the loose meat sandwiches at the Maid-Rite in Greenville OH. They’re dressed with onions, pickles and a smear of mustard, and while an order of these fries is really too large for one person, these are, let’s remember, amazing fries. I had a black cherry milkshake and loved it, and Daniel was somewhat pleased with his butterscotch sundae. Marie had a chocolate-banana milkshake, because that’s her favorite flavor combination. She was not quite as wild about it as she is the great chocolate-banana shakes at Zesto in Atlanta, but we all agreed this was a great snack. We’ll come back one day and try the barbecue, I expect. Posted on May 31, 2015 August 21, 2017 by Grant G.Posted in chattanooga, dairy bars, dessert, tennesseeTagged chattanooga, dairy bars, dessert, ice cream, standout fries, tennessee.